MJ was the Munkedal paper mill’s own railway. The mill produced paper from 1873, mainly for the British market. First, the produce was transported by horse and carriage, later by wagons hauled by a steam tractor. 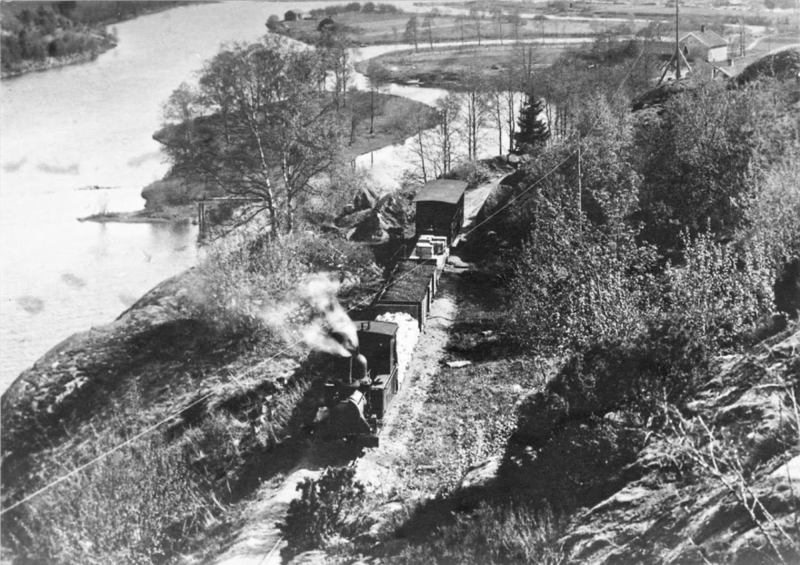 The railway opened in 1895, had a length of 5.6 km and ended at a harbour in Gullmaren, a North Sea fjord. Traffic was shaped by the mill’s needs, but normally trains included a coach. The MJ remained profitable long after the other 600 mm lines had closed, and in 1955 it was rebuilt to standard gauge. Originally, MJ had two steam engines, some freight wagons and one coach. Step by step the rolling stock was extended, often through purchase from other defunct 600 mm lines. In the 1930s, a small diesel shunting engine was acquired. After WW II bogie tank wagons were introduced for the transport of oil. The line closely followed the Munkedal and Örekil rivers, resulting in a number of floodings and landslides. From the early 1900s on, MJ shared a station with the SJ standard gauge railway, where much freight transfer took place.